Having ended Britain's embarrassing Grand Slam hoodoo with his US Open breakthrough 12 months ago, Andy Murray starts his first major as a defending champion Wednesday against France's Michael Llodra. The 26-year-old Murray has added the Wimbledon title since winning the US Open in 2012 and having buried all talk of Fred Perry -- the country's last men's champion at a major in 1936 -- he is confident the nerves will disappear. "Before the first match there will be nerves -- I expect to be pretty nervous because it's a new experience and it's different," said the Scot. "But I think once the tournament gets going, I don't think it changes. There was a lot of pressure on me for a lot of years to win a Grand Slam and then same sort of thing at Wimbledon. I wouldn't imagine it would be the same." Murray could have a potential quarter-final against Czech fifth seed Tomas Berdych, who eliminated him at the Cincinnati quarter-finals earlier this month. But he is not looking beyond Wednesday's match which opens the night session. "It's a tough match. 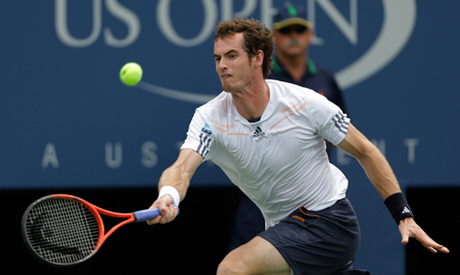 Llodra is tricky player, serves well, very good hands and he's very unpredictable," Murray said. Old school serve-and-volleyer Llodra is 33 and boasts an admirable world ranking of 48 but he lost all three career meetings with Murray. Best known for his doubles successes -- he has 25 career titles -- the left-hander has twice made the fourth round at a Grand Slam, Wimbledon in 2011 and the 2008 French Open. Also on Wednesday, women's champion Serena Williams, chasing a fifth US Open title, tackles Galina Voskoboeva of Kazakhstan while Chinese fifth seed Li Na plays Sweden's Sofia Arvidsson. Two other former champions are also in action in the men's second round. Argentine sixth seed Juan Martin Del Potro, who defeated Roger Federer for his only major title in 2009, starts against Spain's Guillermo Garcia-Lopez while Lleyton Hewitt, the 2002 champion, faces America's Brian Baker. Venus Williams, the 2001 and 2002 women's champion, faces China's Zheng Jie.